In the meantime, I’m still spending my free time in the evenings obsessing about my dining room. I include my entryway in that also, since it’s basically one big room. Remember that buffet that I got a couple of weeks ago? I’ll be using that in my entryway where I used to have the green scalloped console table that I made. But I won’t be using it in its current condition. Other than a few scratches here and there, it’s actually in really good shape, but the current stain color on the wood just doesn’t really do anything for me. So I’ve spent quite a bit of time on Pinterest searching buffet makeovers for inspiration, and I’ve found so many ideas that I really like. This two-toned look is a leading contender. I love painted furniture, and I love beautiful stained wood (as long as the grain is pretty), so with this style I would get the best of both worlds. …so another piece painted and stained in a similar way might be too much, especially so close to each other. One of my favorite looks is the stained top/painted base look. If I weren’t already planning to do that whole stained top/painted base combo on my dining table, I might consider this option. But I think it might be too much having two large pieces of furniture like that in the same room. But this idea….this idea…stopped me in my tracks. This is my absolute favorite, and it just looks like me. I just don’t know if I have the nerve to do that to my buffet. First of all, I don’t even know if that idea would work on mine since I have doors with scrolled, carved details on them. But also, I think I might feel a bit guilty painting all of the wood, especially since it really is very pretty wood with beautiful, subtle grain. So I’ve been asking myself, would I feel guilty because I personally have an issue with painting the wood? I don’t think so. Paint can be stripped if I ever get tired of it, and y’all know me well enough to know that I’d have no problem putting the time and effort into stripping it if that’s the look I decide I want in the future. No, I think it’s more the anti-paint brigade (a.k.a., the “wood purists”) that I fear. Have y’all ever noticed how vicious people can get over a piece of painted furniture? I’ve noticed it for a few years now, starting with the comment section on Apartment Therapy, and spreading from there. Now every time I see a piece of painted furniture being featured on a site like Apartment Therapy or Hometalk, I cringe, and not because I don’t like the furniture, but because I know what’s coming in the comment section. Have you ever noticed this? It brings out heated debates, the likes of which you’d never expect to see on a decorating/design site, but would expect on political websites. 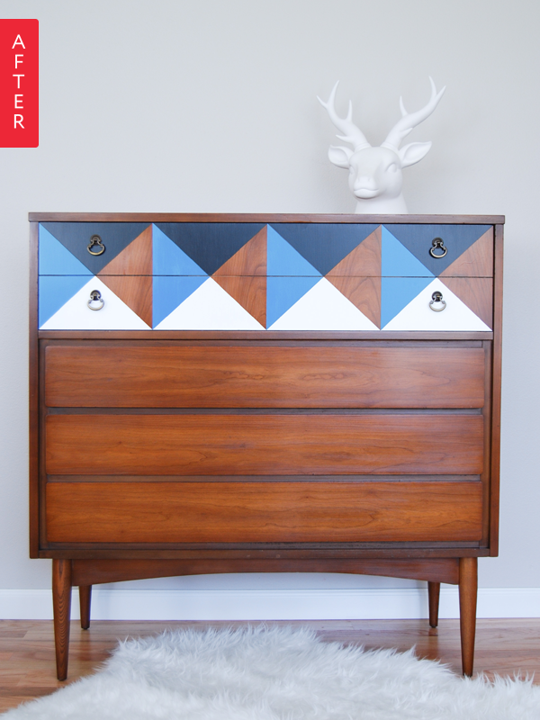 Case in point, this dresser makeover featured on Apartment Therapy. 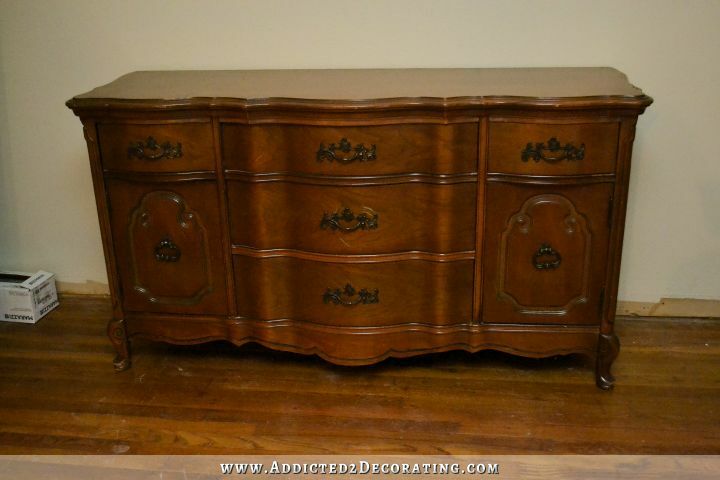 I personally love the design that was done on that dresser, and most of the dresser was left in a natural wood color, but people sure got their feathers ruffled over it! One person even compared the painting of this dresser (which was probably mass produced in the 60s) to painting over a Gustav Klimt painting in order to make it “fun.” Really? I mean, people lose their minds when it comes to painted furniture. 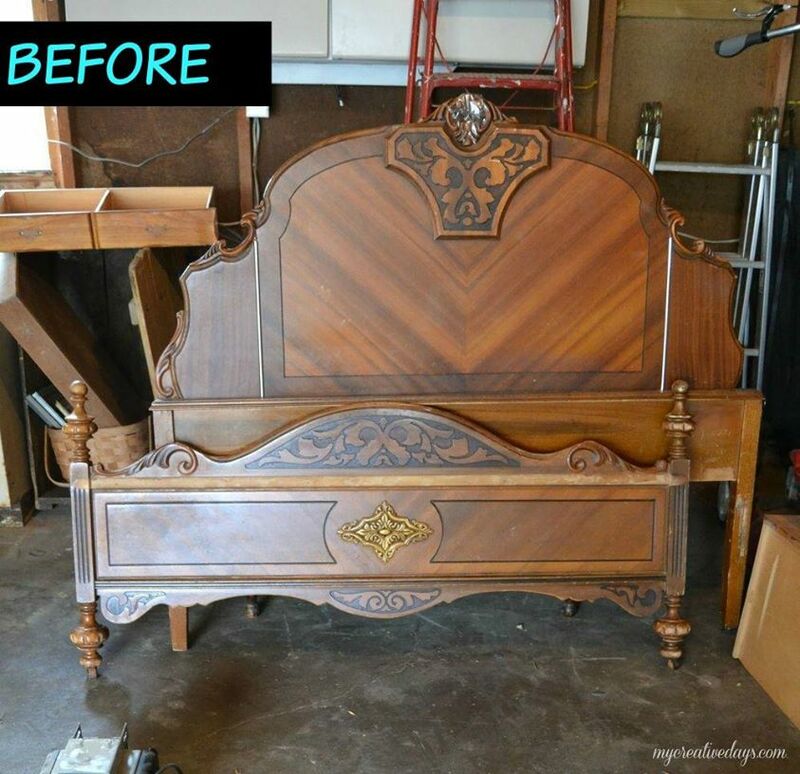 That project was featured on Hometalk, and people lost their freaking minds over the fact that she painted that “beautiful” antique bed! I mean, some of the comments got really terrible, like the person who said, “Was looking good up until the idiot decided to paint it!” Really? Idiot? The funny thing is that all of the wood purists seemed to have no issue with the fact that she literally cut the footboard into pieces in order to make her bench. That wasn’t the issue. The issue that make everyone so mad was that she had the nerve to paint the “beautiful” wood that everyone assumed was a valuable antique. Well, I love wood. I love stained wood. If you’ve followed my blog for any amount of time, you’ve probably noticed that I try to add some natural or stained wood to just about every room because I enjoy the warmth it brings to the room. I love a beautiful wood grain, and I have great appreciation for craftsmanship that utilizes wood grain in artistic ways (even on wood that I generally don’t like, like oak). Remember my oak table with the gorgeous design? Even though I generally dislike oak, there’s no way I could bring myself to paint over that beautiful detailed design. But even with my love of wood, and my great appreciation for wood grain used in artistic ways, I’ll tell you that I think that headboard and footboard, in their original condition, are ugly and gaudy. There’s no way in heck I’d use something like that in my house, even if it was some valuable handmade antique crafted by some famous craftsman (which I highly doubt it was). I think it looks so much better with a coat of paint on it. But people got really mean about it, as they do on just about every single post I’ve ever seen on one of these large sites that features a piece of wood furniture that has been painted. Probably the thing that irritates me the most about the commenters on projects like this is that they seem to have this idea in their heads that painted furniture is a relatively new fad that has only been around for a few years (presumably with the birth of Chalk Paint, since I see a lot of comments like, “I wish this Chalk Paint fad would die!”), and that it’s a trend that will soon die a horrible death, leaving thousands of homeowners mourning the loss of their stained wood furniture and regretting the day they took a brush and paint to their “gorgeous” stained wood. Along with the vogue for painted furniture has come the realization that early American homes were full of color. Not only was much of the furniture painted, but walls, too, were often covered in bright colors. As colorful finishes on furniture and walls dulled through wear or dirt, the myth developed that 18th- and 19th century homes were drab. Modernism also contributed to the dulling-down of American decorative-arts history by emphasizing white walls and natural wood finishes. So painted wood furniture has been around for centuries, and it’s not going anywhere. It didn’t come about because of Chalk Paint. People love to tout the greatness of Chalk Paint, but it doesn’t get (or deserve) the credit for the popularity of painted furniture. But the bottom line, in my humble opinion, is that people have the right to do whatever they want to do with their furniture, regardless of how old it is, who made it, or what kind of wood it’s made of. If they like the piece, but can’t use it in its current condition, then they should be able to change it to fit their home. I just wish that people could share their artistic endeavors without all of the hand wringing and frantic, “OH MY GOSH, YOU’VE RUINED IT!!! IT WAS A VALUABLE ANTIQUE, AND NOW IT’S WORTH NOTHING!! !” types of comments. But that’ll never happen. This ridiculous paint debate, and the unnecessary drama over wood, will continue for many years to come. Go for it!!! While I love the dresser in it’s original form, I LOVE the idea of painting it something fun and funky and YOU! I think people need to take a Chill Pill (yep showing my age here) and remember that EVERYONE is allowed to have their own tastes and opinions! I was raised with the notion that ‘If you can’t say any thing nice, then don’t say anything at all!’. I think some people either forgot that lesson or were never taught it. Go for it. That’s a 1960’s French Provincial buffet. Mass produced and has no value. Do what makes you happy. There are plenty of the old French Provincial pieces still around for the WOOD grain people. Couldn’t agree more. It’s pretty but it isn’t a valuable antique or even rare. Mass produced. Go for it! I am attempting to help a stranger out. Long story short, while viewing an online Buy & Sell, a gal posted a (potentially) beautiful Buffet table for $40. I believe it is worth much more. The outrageous offers she was made brought tears to my eyes, i.e., demanding she deliver it for $20 and less, one actually gave her a sob story as to how badly he needed it and wanted it for nothing! Well, anyway I asked her to hold off selling it and I would investigate and find out it’s true value. I am not an antiques/vintage guru and am having a hard time keeping my promise. Can anyone help me help her? She is such a sweetheart, she offered me 1/2 if I would find her a buyer, I won’t do that. I simply don’t like to see anyone taken advantage of. I agree that painting over wood furniture is no biggie. If that’s what you like, then you should do it! I read an article that talked about Victorian era kitchens, and the cabinets were mostly painted! So painting wood has literally been around for hundreds of years. I agree too! It’s your furniture piece and your house, do whatever you want with it, rare or not! I love painted furniture, and you will make it beautiful as always! The so called “value” of a great piece of furniture only has value if you intend to sell it. I for one am a firm believer that if you have something in your home that you love, it will work regardless of whether or not it’s so called “appropriate” from a design standpoint. Do what your heart desires and make it work for your style and it will be perfect! Actually it only has value if someone wants to BUY it!! I hear ya, but it would have to be for sale first. Apples and oranges. lol. While I admit, I do sometimes cringe a little when I see a beautiful piece of old wood furniture painted, I can’t imagine going ballistic about it and calling someone an idiot for it. Beauty is in the eye of the beholder and if looks good to them in their home, so be it! I would have to say though if a piece was genuinely valuable either in a monetary or historical sense, I’d hope someone would think twice before doing something that drastic. If it was valuable monetarily, you could sell it and buy something more to your liking after all! So true. I love wood grain on valuable furniture but otherwise have fun and paint it pea green with purple stripes. Whatever!!!!!!!! I would go farther and say that even if the piece has monetary value, it’s still up to the current owner to do whatever they want to it. If you like it painted, then why should you sell it and buy something new?! I too used to be on the OMG YOU PAINTED THAT BEAUTIFU PIECE bandwagon. But after seeing some really beautiful painted wooden furniture, I too have come over to the dark side. 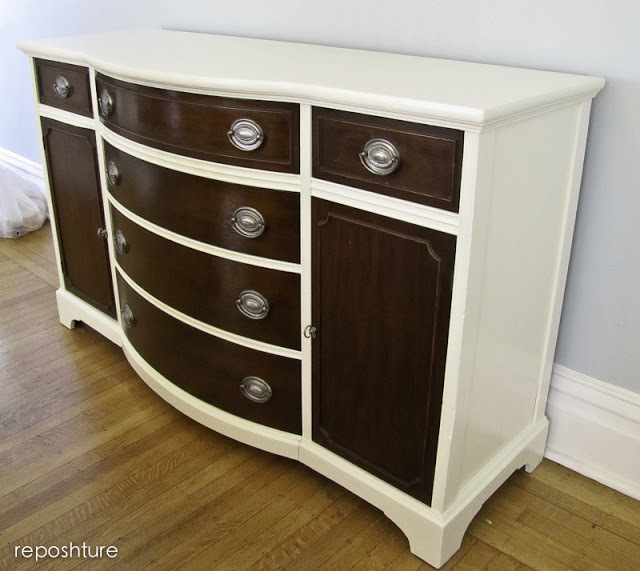 There are some truly spectacular painted wooden pieces of furniture out there….so much so that when I go to my local consignment store, I actually look for pieces to paint over!!!! I paint furniture all the time. I seek it out to paint it, both for myself and to sell occasionally. I make my own chalk paint, tinted waxes, mouldings to put on them sometimes and use every color of the rainbow. I LOVE it and love that a piece that might end up Ina landfill or as someone’s potting bench (one of my “antique” rescues) gets upcycled and reloved again. They make great vanities, regular furniture and changed up into other things, like headboard into benches is popular. The anti paint crowd are vicious, loud and don’t seem to get that it’s none of their business what you do with YOUR furniture, same as its none of my business if they want their musty old scratched up pieces to lurk like dark behemoths in their home. 🙂 paint on my dear and make it sing ! Hearing about the bad storms last night in Texas, we can only pray you and family and friends are all safe. I absolutely love painted furniture, especially if it has seen better days. In fact, I look around my house and most is painted! I saw once in “Style at Home” mad, they painted a dresser similar to yours in high gloss white including hardware. I love all your examples so I look forward to seeing your choice. It does inspire a whole lot of people out there…your email is always opened first! Thanks! While I have been know to FREAK at the idea of painting good wood furniture, I told you before that my mother had that “French provincial” dining room set. I hated it. When we sold the house after my father passed away, and my mother downsized to her Cape Cod Cottage, no one in the family wanted her furniture! Luckily, a friend of my brother wasn’t that picky and she took the dining room set. There is just something about the fruitwood that just isn’t everyone’s cup of tea. I think it would be lovely painted. Go for it Girl! My hubby was a staunch no paint on wood person until he saw some of my transformations on some old 70’s pieces. The piece although very solid and well constructed it had been lived with very roughly. After painting it made it look brand new for much less than the cost of a new piece of furniture. Painting allows for creative expression plus keeps good furniture in use and out of the land fill. You do what ever your heart leads you, it will be great! What about leaving the wood grain as-is, and panting the 3-e embellishment/ decoration….so, like the green dresser that inspires you, leave the green as the sold wood, and where they painted white, you could paint a color of your choice? I know whatever you do will be awesome! Kristi, this has been the Decorating Topic of the Week for me, only because I commented on this discussion on Houzz http://www.houzz.com/discussions/3034195 and every time there is a new comment I get an email. Larry David also made fun of the way people feel about wood furniture on episode 10 of season 7 of Curb Your Enthusiasm “Larry Respects Wood” over the failure to use a coaster. It’s like some kind of Modern Day Pantheism! I started to have a disdain for stained interior wood trim when we were house shopping in Pittsburgh and too many houses had cheap builder grade brown stained trim outlining every window and wall. And don’t get me started on the kitchens and “studies” that were a total bath of brown. Combine that with a lot of gloomy weather and it was dark and depressing. Stained wood grain is usually brown and brown is a color that you have to take into account for pleasing decor. It becomes part of your pallet. Brown can be reddish, orangish or blackish. It is not a neutral! Whatever you decide will be amazing. I like the stained top with painted bottom, personally. Thank you for this comment box to vent my feelings about wood grain enthusiasts! Your story made me think of my girlfriend’s house. When she bought it all the trim was stained – a complete waste since it was paint grade trim and all finger jointed. The people who bought it couldn’t bring themselves to spend the money on stain grade trim – so the result was uneven colour all over the place and the finger joints sticking out like sore thumbs. My friend’s husband is one of those “don’t paint wood” guys (like so many guys are) and it took her years to get him to allow her to paint the trim. He finally relented and admitted it looks much better now. Go with what you like. The green with white looks like you. Who cares what other people say! You know what you like and what will look good in your home. Just love your blog. I say go for it. But…painting over historic faux painted walls and doors are a huge no, no. Period. One room with 1885 faux painting in our historic home remains untouched and one closet door, on the inside. Now I am stripping the layers of cream and white paint to hopefully get the wood back to looking similar to the original. The previous owners most likely would never have painted their antique furniture, but had no problem obliterating the walls and doors. Oh that they had painted the furniture and left the walls/doors alone. If I had your buffet, I’d love to do it like the blue one; however, I think the green one is definitely you! Love them both! Renee, what is your blog? I’d love to see what you describe. I love fearless decorating. WHAT?!?!? YOU’RE GOING TO PAINT THAT BEAUTIFUL BUFFET??? HAVE YOU LOST YOUR EVERLOVIN’ MIND??? 🙂 Ok now that I got that out of my system I have to say that I love the Paper Daisy Design. I don’t think it would be too much to have two large pieces of furniture in the same room with stained top and painted bottom. I’m not sure exactly where you plan to put the buffet, but I’m thinking it will probably go at the opposite end of the room. The table will have chairs around it, so the painted bottom will not be that noticeable unless it is a really bright color. I agree that painting the body and leaving the top would potentially balance very well with the table. Another thought I had was to only paint the doors and drawers, then adding the gold accents. You could even add the gold accents to the wooden parts of the body. I can see it with the green from your kitchen cabinets, which would tie the two rooms together. The people who freak out about painting wood furniture need to realize that it is not their furniture and they are only seeing a picture (which doesn’t show all the details). That painted bed bench would look great in your breakfast room! Good for you! I’m a furniture painter and instead of “ruining antiques,” I see people appreciating what they are for their craftsmanship. A few years ago when I started painting and selling furniture, I could find pieces on the curb or on Craiglist for $5-$10 all the time. Now, people are starting to appreciate what they have because they can update it. House design is more casual than it used to be, and the furniture is too. And, it can all be stripped off in another hundred years and re-used. You can’t say that about anything you buy in a furniture store now. Wow, just wow! Perhaps you “should” have followed your rule…IMHO. You are getting so many comments these days it takes forever to read them all and I try to but if I skipped one that says this, I’m sorry. YOUR house, YOUR furniture, YOUR life and if you didn’t take chances once in a while I would never have the courage to either. You are my inspiration. Thanks. GOOD FOR YOU!!!! I love natural wood 99% of the time it is my favorite, and sometimes even I like painted wood pieces. But I agree that it doesn’t matter how ANY ONE ELSE FEELS!!! It is YOUR home, and anyone else can go fly! You make your home beautiful, and if someone else cant see that, it is their loss. Standing ovation! Honestly, I am so sick of all the internet antique experts (said in a very sarcastic tone) throwing their hissy fits about the so-called value of mass produced, low cost, twentieth century furniture! Seriously! And all the mid-century stuff? Ten or fifteen years ago you couldn’t give that stuff away at the end of your garage sale, but now it’s “priceless”. Please. Paint your furniture to your heart’s content and give no thought to those who will judge you. Life’s too short! I LOVE the blue buffet with the stained top. 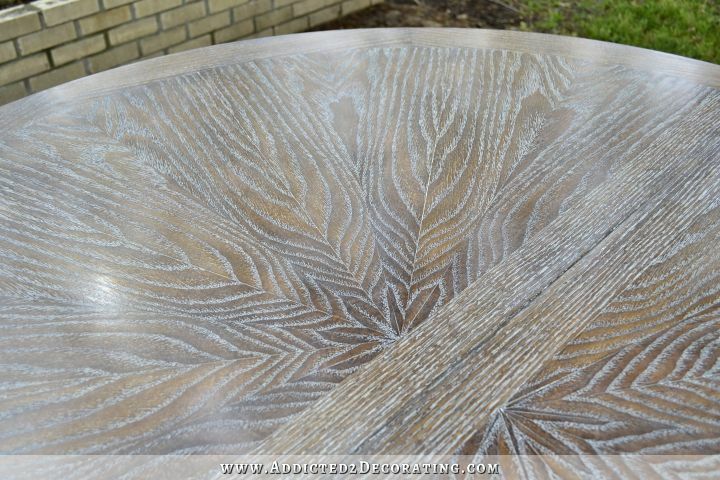 I don’t think it would be too much with your table top stained. In fact I think it would tie them together, but not be too matchy. I’m glad someone mentioned the apparently even more heinous act of painting something sentimental. For our wedding, we received a wooden paper towel holder from a sweet old fellow at church. He had used a wood-burner to inscribe a very kind note on the bottom, but there were two problems: we already had a home for our paper towels, and more importantly, his creation was stained that greenish-yellow color, which I personally can’t abide. After contemplating the situation a while, I spoke to my husband (definitely team Wood Grain), and asked if I could paint it so that it could be left out and occasionally admired in my craft room. I’m so delighted that we took a little chance on altering something that had emotional value to make it more useful and enjoyable to us. It’s okay if you love the look of wood, but it’s equally okay not to! I painted a sentimental piece that was originally my uncle’s. It is a mid-century night stand that was blond wood and it just didn’t go anywhere. My mom kept telling me that I wasn’t allowed to paint it (I was in my 30’s lol) and I finally did. I painted it black and switched out the hideous hardware and use it in my home office to hold my printer and other miscellaneous items. I love it now and I see it every day! Before I had it in my closet and it was just a catch all. I am starting to work on my fiance’s great grandmother’s china cabinet and buffet. The buffet has water damage (not the kind from a coaster, the kind from a roof leak when you are out of town!) and I have had to use wood filler to fill in gaps between the top and the back…his mom is so excited to see them in our home and told me to paint them or whatever to make them mine. I am a huge believer in making something yours and that you will love and be proud of. 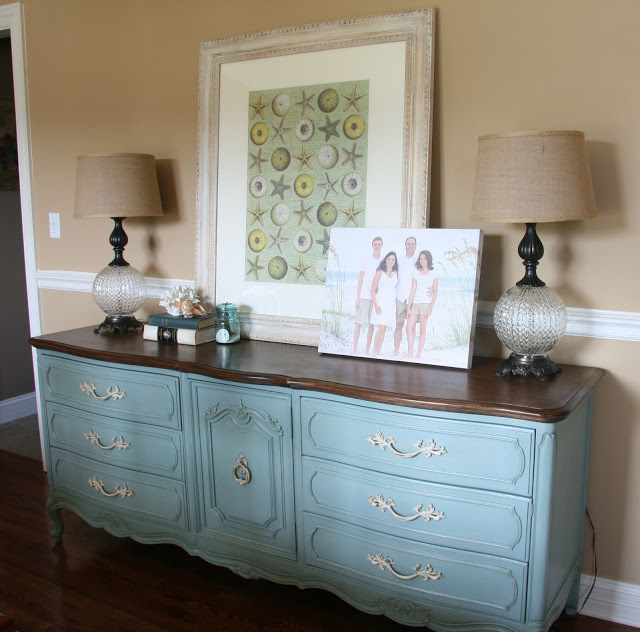 Your buffet will be beautiful painted like the BHG buffet. True yours has more trim, but it will give it more pizazz! Can you possibly photo shop your buffet to get a visual idea of how it will look!?! I had to laugh at your last comment. I received my parent’s bedroom set when they downsized and moved. A beautiful solid, heavy, light oak set – complete with dresser, high boy, night stands, and headboard. Although not exactly my “choice” if I was buying, I’ve already determined I can’t/won’t do anything to the set, because I’d be afraid to tell my mom! 1. It is your piece of furniture so what you do to it is YOUR choice, nobody else! 2. It would be a way to bring that kitchen green color into your dining room. 3. I love the creative things that people do with older furniture to give it ‘new life’. 4. Don’t read the comments. Anyway – it’s a well made piece of furniture of the style popular in the 30s and 40s. Nicely turned legs and some detail on the top and bottom drawers. Those pieces are common – and not particularly valuable. It had some nice bookmarked veneer on the drawer faces – but like many pieces of that vintage it was covered with a dark varnish. That’s because it’s not all made out of the same kind of wood. That too was common at the time – and the reason for the dark stain. So completely stripping a piece like that leaves you with the issues of trying to get the stain to match across various types of wood – or using a darkly tinted varnish. Neither option appealed to me – so paint it is. I’m doing it in black milk paint – no chipping or distressing – and it’s looking good with a smooth velvety finish. I love it. I’m eyeing the vanity come desk next. I don’t have a problem painting wood be it furniture or trim – I’d certainly not paint something that had a particular historical value – but common wood furniture? Have at it I say. I get really annoyed on decor blogs when the anti-paint on wood crowd start crowing. Don’t like painted wood? Fine. Don’t paint yours. Go Kristie – paint your buffet. And that’s my rant for the day. LOL. Oh, and I swapped out the old ornate handles for a set of mercury glass knobs with pewter escutcheon plates. Such an improvement. That being said, I really like your ideas of painting! In fact, I really love your green credenza but in this case I would steer away from the solid green. You could make the base paint a more neutral color like cream, leave the doors and drawers and then use green and the base color to bring out the scrollwork? For example, on the green one you like, swap the green and white but leave the doors/drawers wood? Just a thought, I’m not sure if this would be too busy. Anyways, LOVE your blog and thank you for a great post today! I love painted furniture, I just don’t like a “crafty” look. If you could purchase a piece from a manufacturer in a finish like you have envisioned then go for it. But, if the piece is going to look “crafty” and hodge-podge like then I think it cheapens all the investment in time and energy that you put in the item and devalues the remainder of your home. I think it’s important for your eye to be able to wander around your room and take the room in as a whole. It is disconcerting for your eye to be stopped at each individual piece of furniture or wall and take in what is going on before progressing to the nest wall or piece of furniture. Too many stripes and curly-Q’s and changes of finishes and patterns are disconcerting to the eye and bring confusion to what needs to be cohesive. I don’t know if that makes sense but I guess what I’m saying is accentuating the details of your piece in my opinion will cheapen the look of the piece and devalue the effect of your room. Every piece of a room, every wall, every element should not be a “feature”, it’s very troubling to the eye and creates hodge-podge rather than beauty. Unfortunately a large majority of the population simply parrots what they hear someone else say. People are ALWAYS more important than material things. It is terribly DISHONORING to charge someone with “making a stupid decision” when they have simply reused, refurbished or redesigned ANYTHING to fit their needs or wants. Painting wood furniture is NOT a moral issue. Kristi, you must ONLY design for yourself and your husband. Don’t put your energy into placating foolish people. I like you. I like what you do. You don’t need me to “approve” of all your design decisions. You wouldn’t approve of all of mine. And that is exactly as it should be. Donna has it right – how to decorate furniture, even though a big decision in order to make your home more beautiful, is not a moral issue and thus does not require so much of emotional or judgmental reactions to it. Moreover, it does.say something about our time and way of communication when people demand of others to behave correctly (such as not painting furniture.being the “right” thing) but cannot themselves behave right in their way of talking to each other due to the anonymity of the web. I cannot wait to see what you are going to do with that buffet, as I know you will inspire me no end again – and personally I wouldn’t want to keep it myself were it that colour as I’m not much a person for middle brown things. It’s a question of taste, nothing more – thank you very much that you keep on sharing yours and your decisions with us in order to give us loads and loads of great ideas!! That buffet is just begging to be painted, Kristy. I love the first example for it, the two tone look. If you were going to buy this piece and re-sell it, I might say, no… please don’t paint it. If you are planning to use it in your own home? PAINT THE HELL OUT OF IT. It’s YOUR furniture, and YOUR home, and YOU have to love it everyday. I’m sort of fighting this within my own family, so I may be a bit touchy on the subject. Sometimes, wood just needs color. And it’s not as if it’s a national treasure. You’re not painting George Washington’s desk or anything. Go for it! I just hate it, that people feel they can say anything when they comment on blogs or facebook. I have seen some very nasty comments that were rude as well. It’s just your opinion after all, no need to make it nasty. ( how highly some think their opinions are). I definitely think we need more manners in social media! I love everything that you do, so I’m sure whatever you do, it will be beautiful. I always look forward to your blog. 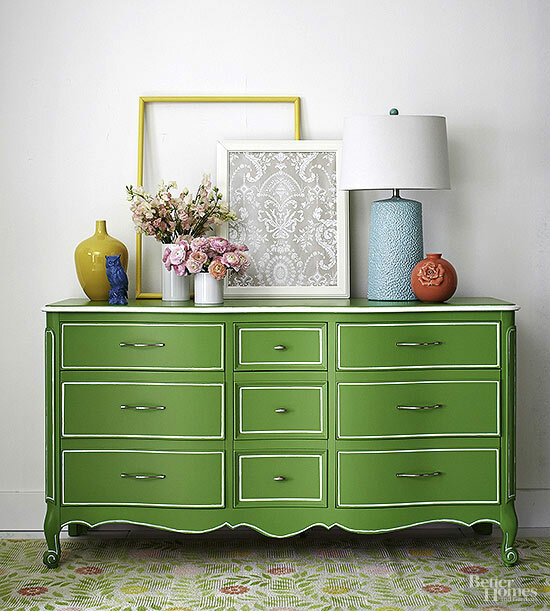 Love that green and white sideboard! As far as painting furniture goes I’m of two minds. If a piece is a truly important antique piece, it should be left alone. Sell it if you don’t like it. If it’s just a one in a million piece of ugly old furniture then go for it! As far as that bed/bench fiasco, I think what she did to it is both hideous and a bit tragic, but I’d never say that to her. It was hers to do what she liked with and clearly she has different taste than I do. I’m a bit concerned though that people in their rush to do Pinterest makeovers might actually destroy something truly valuable and important. More than one museum piece has been found tucked up in someone’s garage holding old paint cans. anyone else says. Knowing you it will be beautiful in the end! Good Lord, are we back to this subject?! Lol Kristi, I love MY antique wood pieces as stained wood, but they are in excellent shape and work with my eclectic taste. I do not love your sideboard as is for your house. My favorite pic is stained top and solid painted bottom possibly accenting the trim with some dark wax to bring out. Nope, I do not think having 2 stained top pieces will be too much … they will tie spaces together yet be distinctly different in style. Hoping for a surprise with the color especially not the lime green! Yay for paint! 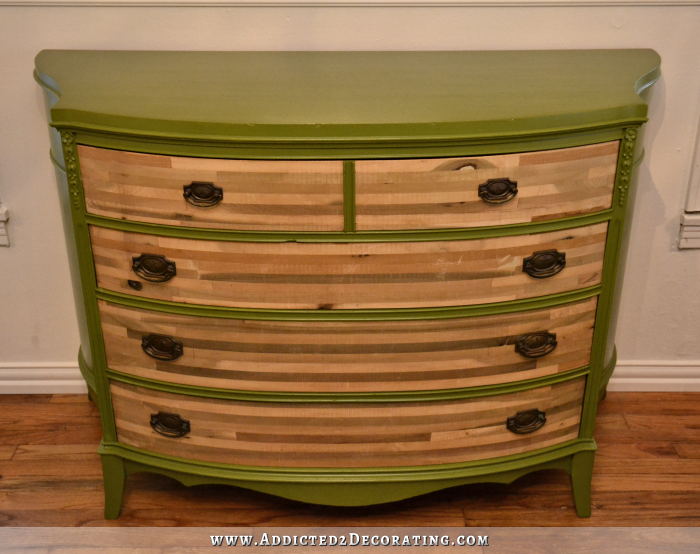 Anyone know where I can find the color name of the green paint on the BHG dresser? I can’t seem to find anything on it. TIA! Glad someone finally addressed this topic. Just like paint, I think wood finishes go in and out of style too. Recently I purchased a waterfall bedroom set that was certainly mass produced. It had such an ugly finish but I painted and stained it and now when I walk past it I smile. It makes me happy. Life is short. Try to do more things that make you happy. If you like paint go for ot…you have to live with the buffet and Look at it every day and not the People commenting. You can strip it after all if you change your mind! Oh I just went back and looked at your buffet , what about painting the bottom of table and buffet the same, stain the tops then bring in some of that gorgeous gold leaf in your kitchen to the ornamentation of the buffet…just a thought. Oooh, I like this idea! The idea of adding a thin gold leaf to your piece is a tie to your gorgeous kitchen. I like the idea of a stained top and black bottom like the dining room table. And the rolling doors in the music room. Black can give the other colors you use a rich intensity. I don’t care for curtains in my home. My mom, grandmother, and MIL love them. I’m good with that. I think every home needs a mix of painted and unpainted finishes or it all becomes too much. As for value, the only true value a piece has comes from the joy and use it provides its owner. The point is, you treat furniture such that it will provide the most value for you, and I will treat furniture so that it will provide the most value for me. I won’t be snarky about your choices. I love painted furniture but there are some pieces I prefer not to paint. The pine breadboard ceiling in my living room won’t see any paint anytime soon. Go for it! I can’t wait to see the results. First my apologies if someone else has already suggested this, I’ve not had time to read all the responses. I think your new piece has wonderful lines and shapes that make it perfect for a combination of wood and paint and if you prefer to have only one such piece, I think you should paint the drawers on your green cabinet. In any case, whatever you decide to do never disappoints :). How IRONIC Kristi….just this morning I found myself in a ruse with a woman from Hometalk. She was wagging her finger at me, because i was taking up for the poor homeowner, who decided it was best to remove one of those older brick fireplace/bbq pits from the 60’s. There were quite a few, giving her the devil for it, and I made my comment stating I thought they did a fine job, and if they didn’t want to keep something they felt was an eyesore, more power to them, after all, they out up with it for 17 yrs., surely they knew it didn’t serve their family well, but a hosta garden would?? This person felt the need to tell me I shouldn’t be mean, heck I didn’t think i had been mean, these comments people make, are way out of line IMHO, and quite hurtful to the person putting themselves out there to be critiqued!! 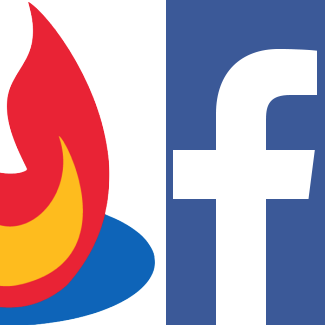 Just like you endure all the time here, or on your fB page! I hate bullies…period. Opinions are one thing, but some people go way overboard in theirs!! “Didn’t you see her smiley face in her post” she tells me…like whatever, if your being tacky, smiley face or not, it’s not nice…period!! I completely understand and agree with you! “Value” really comes down to personal preference, doesn’t it? Just because something is old or was expensive when it was built doesn’t make it pretty and doesn’t mean you personally have to like it and want it in your home. I’ve seen some pretty darned ugly antiques and some really pretty ones that are not my personal taste. We have a room in our home (I think I’ve mentioned this before) with high-gloss yellow oak floors and wall-to-wall, floor-to-ceiling knotty pine tongue-and-groove paneling with a clear matte finish. That room also has a rustic New England fieldstone hearth. To put it bluntly, it looks like a ski lodge. Is it nice? Yes. Was that paneling expensive to install? Absolutely. And when it was installed, probably in the early 90’s, pine board walls were the thing that everyone wanted (at least here in New England). All that said, I did have that sort of weird gut reaction the day you installed brand-new wood flooring in the kitchen and decided to paint stripes on it. 😉 I think it was because oak is pretty high-cost (as flooring goes) and it didn’t make sense to me that you’d buy it new just to paint over it. Kind of reminds me of the mommy wars. The Internet makes it safe to shoot, slash, and run. Do them a favor by showing them the door and suggesting they find a way to make a positive difference in this broken world. What about painting the top, leaving the bottom stained and putting on new hardware? It will look great however you decide, have fun with it!! If you look at the beautiful, iconic rooms done by Sister Parish, you’ll see that she limited the pieces of stained wood. You’ll also find that the painted furniture is obviously fine, and she painted it anyway because she created a more beautiful room by painting it. This is one of the reason I quit following Nicole Curtis on FB. She is down right rude to people who paint wood. However she did say if it was 80s wood you had her permission. That just about made my explode. I believe that if you are going to get more use out of something by making a change, then do it. Be it painting, currying off legs, or cutting it in half, do what works for you. This article mentions her having furniture painted, as well as floors. Oh my gosh, paint it by all means! People really do get mean about ya painting wood dont they! And I never understood it. A piece of furniture’s value is based on how much you love it! For the “purist” out there, if you really have some spectacular wood grain or a beautiful burl pattern then I would never cover it up. But so much of our furniture for the last 50 years or more unless high end to begin to begin with, have not used the beautiful wood we all love so. So, paint your heart out. Also, you know what to expect so just don’t read those comments. As for as the history of painted furniture, ever looked at some of the painted Chinese furniture (chinoiserie) that is painted (lacquered) and absolutely gorgeous. It only goes back a thousand years or so. That style and other painted pieces have been popular in Western Europe for several hundred years, some of it because of the admiration for the examples from China. So, I really don’t think you are doing anything that hasn’t been done before! I love the idea of painting the buffet. Personally I prefer painted furniture and cabinetry, and I can throw in a stained top here and there because that’s pretty too. I love that you can turn an ‘ugly duckling’ old piece of furniture into a ‘swan’ by painting it. All the example pictures you showed were awesome, so I’d have a really hard time choosing. I’m excited to see what you do with your buffet. I’ve embraced color on furniture pieces because of you (thanks!!!) and can’t wait to see the color you choose! Is the buffet a valuable antique? Or is it a veneered, mass-produced piece made in the 60s-70s? There might be some slight ‘antique’ value since it’s over 25 years old, but it’s by no means an historical, museum-quality piece of furniture. I’d paint it in a heartbeat. I love the look of the painted bottom and stained top. There must be something about the lines or the style that really appeals to you, so pick a color that will accentuate that and don’t worry about it coordinating with the table. Matchy-matchy furniture was popular way back when, but not so much nowadays. I like all the versions above, but since you already have one credenza with a painted body and woodgrain drawers, I think either the solid green with white detailing, or the solid sky blue with the stained top would be less repetitive. The green would echo your kitchen cabinets, yet not exactly so since the detail would be white rather than gold, and the blue would introduce another color from the beautiful fabric you’re considering to cover the wing chairs. I’ve found that many times it works better to just let the room ‘grow’ by getting the basics in place, then make the decisions regarding peripherals as the basics are completed. Functionality of the room and focal points will determine the best furniture arrangement, and fabric choices will suggest the color scheme. Once the basics are completed, the accessories will better fall into place. Other people’s opinions regarding painting furniture is just that – their opinion, and YOURS is just as valuable as theirs, even moreso, especially since it’s YOUR furniture! There is something to be said about taking a piece of ‘old’ furniture and painting it to give it a ‘new’ life and ‘new’ look, like the bedhead you showed. Now painted and re-purposed as a bench, it’s looks just gorgeous! I think you definitely should paint your buffet and give it a new life and look and I know whichever direction you choose, it will look stunning. Personally I like the BHG design the best, it looks so classy and elegant but perhaps a different color, taken from the fabric you like for the chairs, with gold accents so it incorporates the gold color in the chandelier you are going to put in the dining room. Can’t wait to see what you’ve been doing in your condo this week. I absolutely LOVE the painted green with the white trim on it. That to me looks RICH! Maybe you’d want to do it in a different color, but to me that is beautiful. I also love oak, but I love love love painted furniture! And I would NEVER ever encroach on your ideas for YOUR home by trying to tell you what to do! Hi Kristi, painting wood furniture is a personal choice and I say do what you want. As for this piece this is what I would do. I’d match what ever you do with the table. If you restrained the table top and painted the base black( or whatever colour) for example then I would restrain the top of the buffet and paint the bottom black and add gold knobs. Or paint the buffet black and restain the drawers only. In my opinion, I’m not terribly passionate about painted furniture either way. I prefer the stained and finished look, myself, but I can still definitely appreciate a beautifully painted table or dresser. Really, if it turns out beautifully, I couldn’t care less whether it was painted or not–I’m just happy to see something turn out so well. I thought that the images of the dressers from Reposhture and Paper Daisy Design were beautiful. Though I do have to say that it’s a shame people become so obstinate about something like paint. It’s someone else’s home, and someone else’s style and property, so why should they get so heated up about it? A PERSON HAS THE RIGHT TO DO WHAT THEY WANT WITH THERE FURNITURE,I THINK ITS A SHAME THERE ARE PEOPLE WHO JUST HAVE SAY SOMETHING MEAN,DO WHAT MAKES ONE HAPPY,I HAVE LEFT COMMENTS ON OTHER SITES,BELEAVE ME I KNOW WHAT ITS LIKE TO HAVE SOMEONE INSULT YOU,ITS HAPPEND MANY TIMES,I FEEL THE SAME WAY,IF ONE WANTS TO PAINT,DO IT.PAINT ON. It’s hers, she can paint it if she wants. Well, she painted over history. Well, she painted over history with a verve and freshness befitting trending aesthetics. You got your refurb in my vintage. It’s got a second life. [dusting off hands] There! Now we’ve had that conversation. As you were. Er, I screwed up my tags, and that last sentence was from me. I’m not in the habit of quoting myself! I agree with you. Paint it. It will be gorgeous! You made me giggle. The ‘ugly’ 70s furniture that ‘simply must go’ was once prized and appreciated. The painted pieces from a hundred years ago are being stripped and sanded and ‘antiqued’ now. Trends change. I like all of the painted “looks” you showed, and I also appreciate a good wood restoration. My only thought about the BHG green and white one is that it looks a lot like your kitchen cabinets. It’s very pretty, though. Is it okay if I secretly hate the really bad painted distressed pieces that are on trend right now? By all means, yes. 🙂 Even with all of my love for painted furniture, I cringe when I see a beautiful piece of furniture chalk painted and distressed beyond recognition. Makes me sad. My personal feeling about “distressed” furniture in general: It was done either to hide expected future damage inflicted by children and pets or to cover up a poor paint job. But I would keep my opinion to myself. Just a thought, you have a few painted pieces going on in close proximity. Why not freshen the sides of piece and refinish the top where it’s worn. I personally love wood and painted furniture, just work with what looks best of new your space. If you want to paint it…GO FOR IT!!! I love your creativity and willingness to be a little different than the trend. I have a similar style buffet and I would like to have a custom piece of soapstone cut to match with the curved edges of the top and paint the bottom in a bold color. It was your bathroom article about the painted vanity that gave me the courage…Keep up the excellent ideas! When I was refinishing and repairing antiques professionally a zillion years ago, I was of the anti-painting wood crowd, but now I feel that if it’s yours, do what you want to it. That being said, a couple of thoughts: I think painted and stained sections look fine together, but if the top especially has a beautiful “figure” in good condition, it would be a shame to cover it with paint. The figure would make the whole piece unique, whereas a painted top would make it more ordinary. This period of furniture probably has either mahogany or walnut veneer on the top. One of the things I do not understand about some people painting furniture is when the same pulls are used. One of the reasons for refurbishing is often to make it more modern. Why then would they want to keep the old French Provincial or Hepplewhite-style hardware? How are you doing, Kristi. I’ve missed your reports. 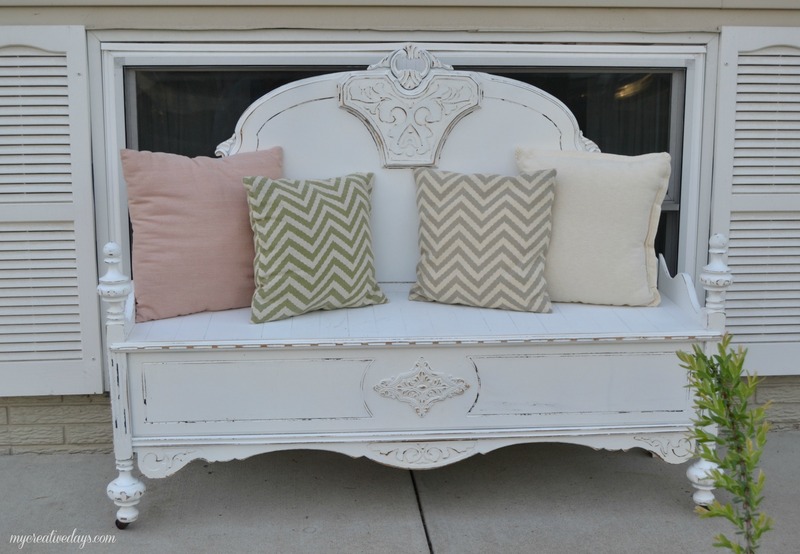 I am in love with the way you remade the headboard and footboard into a bench. The vintage finish you did on it makes it even better. My husband and I really like upcycling and refinishing furniture, and I’ve already emailed him a link to your site! I already have tons of ideas from your pictures for some of the pieces we currently have. Thanks for sharing your work!